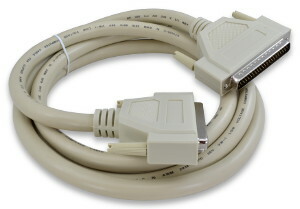 These are extender cables for devices which use a DB-62HD (high density) connector. All 62 pins are extended, and the wiring is straight-through (pin 1 to pin 1, 2 to 2, ...) including a foil shield around the cable and connecting the shells. The wire gauge is 28AWG. These cables are beige/grey in color. These cables have 3-row high density connectors. Cables with "V2" in the part number are constructed with internal pair twisting, in which pins 1&2 are twisted, pins 3&4 are twisted, etc, up through pins 61&62, all surrounded by foil and braid shielding and PVC jacket. Technically, the correct term for a DB62HD connector is DC62, but that term is not commonly used.